Whether your community issues municipal bonds once a year or once every 10 years, it pays to be an informed issuer. A free online course developed specifically for municipal government professionals provides engaging lessons to highlight best practices and potential pitfalls of the bond issuance process. Created with input from senior government finance professionals, the course allows participants to assume the role of an official responsible for issuing municipal bonds. Pick a financing team, practice financing projects using real-world scenarios and earn continuing professional education credit at no cost. The course, "Being an Informed Municipal Bond Issuer," highlights best practices and potential pitfalls in the municipal bond issuance process—information that is useful for elected officials as well as any government professional involved in a bond transaction. Among the topics covered in the course are the roles and responsibilities of key members of the financing team and the disclosure obligations of an issuer. 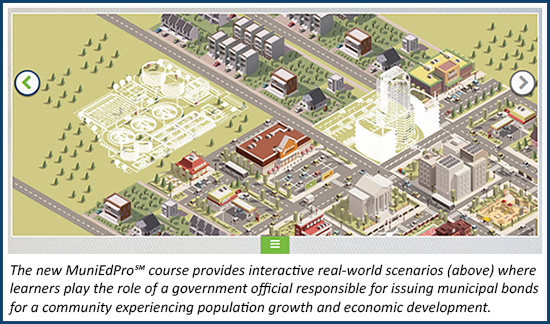 "Being an Informed Municipal Bond Issuer" is part of the MSRB’s MuniEdPro℠, a suite of interactive, online courses designed specifically for municipal market participants. Register for MuniEdPro℠ to take the free, 45-minute course. For any organization that wants to provide the course to a broad audience, it can be integrated into in-house learning management systems. Contact Ritta McLaughlin at rmclaughlin@msrb.org or 202-838-1306. 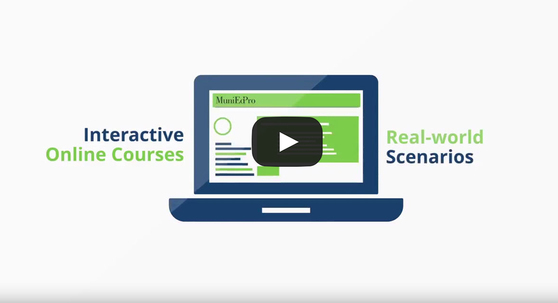 Watch a video to discover how MuniEdPro℠ courses use real-world scenarios to reinforce understanding of municipal market activities and regulations. 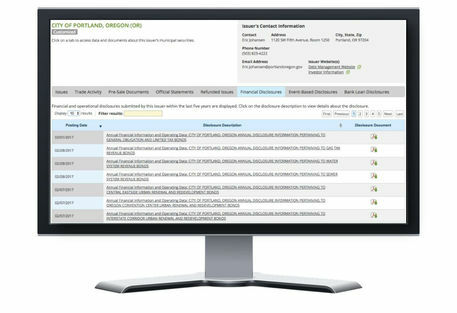 Each issuer has a unique issuer homepage on the MSRB’s Electronic Municipal Market Access (EMMA®) website with all their disclosure documents and recent trade data. Issuers can exercise more control over how their information is presented on EMMA by customizing their issuer homepage. View all homepages in your state using EMMA’s map-based “Browse Issuers” search. Customized homepages are indicated with a label. It's Your Deal is a new quarterly resource guide published by the MSRB to provide objective and useful information to state and local governments that issue municipal bonds. As part of its mission to protect municipal bond issuers, the MSRB regulates municipal advisors and municipal securities dealers, operates the Electronic Municipal Market Access (EMMA®) website, and offers free educational resources in the MSRB Education Center.